Bigger boulder climbing demands bigger pads. The usual-sized crashpads can be too small and risky for bigger crags. For safe bouldering, you need to look for the bigger and thicker pad. While searching, you may have come across many boulderers suggesting Organic Big Pad. So, why is there so much fuss about the Organic Big Pad? Well, the quality and durability of the pad make it unrivaled. The thickness is praiseworthy, the foam offers a better landing, the overall construction is amazing, and the pad is quite durable. Open Size 46"x 58" x 10" / 46"x 58" x 8"
Folds Down To 46"x 58" x 5" / 46"x 58" x 4"
As the name suggests, this pad has a very wide landing area. At 46” x 58”, the pad provides the big enough landing surface. It safeguards boulderers during the big falls. There are only a few pads that are as big as Organic Pad of this caliber. But, bigger pads also means you need more space in your car to accommodate the pad. So, if you have a small car, then you will have to use the space of your passenger seats. Along with the pad’s wideness, the thickness of the pad is equally praiseworthy. Organic Big Pad has two variations when it comes to thickness. You can choose between 4” thick foam and 5” thick foam. When you compare other crashpads with this 5” thick pad, they look so frail. So, once a boulderer starts falling onto this pad, s/he will merely look for other pads thereafter. As the pad is considerably bigger than other pads, it is heavier as well. Many Organic Big Pad users reveal that this is the heaviest one they have ever used. At 19 pounds, this pad may quickly make you struggle while you are carrying it uphill for long. Moreover, the bulkiness of the pad makes the carrying further difficult. If you feel the 19 pounds for a pad is too heavy to buy, you can opt for 4” Big Pad instead of 5”. This reduces about 2 pounds of weight. But, you are opting for a pad that is huge and longlasting, which certainly should be heavy as well. So, the weight may not be a huge issue. For easy carrying, Organic Climbing has built a few features including the adjustable suspension system and the hip belt. With the adjustable suspension system, you can adjust the shoulder straps to the point where you feel most comfortable at. The pad also has a chest strap to make it portable. Furthermore, the 2” hip belt lets you distribute the weight of the pad to your hip. If the staps wear out, you can replace them with a new one from the Organic Climbing. There are three convenient handles in the pad. The two handles are on sides whereas one is in the middle for easy carrying. You can also use these handles as the attaching points. The strong metal buckles on the pad are another admirable section of the pad. Their small size keeps them out of the way while landing on the pads. So, there is no chance of those metal buckles hitting on your face or other body parts while landing on the pad. Organic Pads are popular for exceptionally high-quality foams. They use the time-tested foams to build their pads. In all their pads- the Big Pad, Simple Pad, and Full Pad, you will find a layer of closed-cell rubber sandwiched between layers of memory foam. Organic Climbing uses 5” foam in the Organic Big Pad. The core of the pad has an inch of closed cell solid foam. On the top is an-inch memory foam that immediately absorbs the impact of a fall. On the bottom, you will find 3” soy-based high-density foam that cushions your landings. As you unbox this pad, you may find the pad to be a little stiff at first. But, as you use it for a few times, the pad becomes soft enough to absorb big falls. And the pad stays that way for the rest of its lives. There are boulderers who have used this pad for years. The Pad has the USA-made 1050d ballistic nylon as the shell. This is the same materials that bullet-proof vests manufacturers use while building vests. 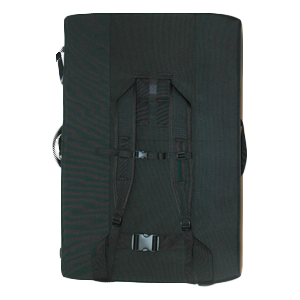 Likewise, the landing zone features 1000d Cordura which is extremely durable. So, the cover of the pad can withstand excessive use for years and still remains fine. This is why some boulderers throw the pad down the slope instead of carrying it down. And amazingly, even after countless throws, the pad remains undamaged. Likewise, the stitching is remarkable. The beefy stitching keeps the pad in proper condition even after excessive use. 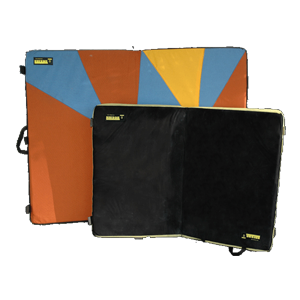 Like other pads of Organic Climbing, Organic Big Pad comes in different color and design. You can order the preferred color and design of your pad. There are more than 40 colors available with a countless design. You can choose any kind of color and pattern for the landing zone. However, the 5” Big Pad has only 6 color options for the outside shell(except landing zone). And the 4” Big Pad comes with default black color at the outside shell. At USD 315, this pad seems more expensive than other usual crashpads. But, the quality and the durability of the pad is worth every penny. At no point in your bouldering journey, you will feel like you paid more than you should have. And it’s obvious that you cannot compromise when it comes to protecting you. If you prefer the 4” Big Pad, then the costs come down by 15 USD. 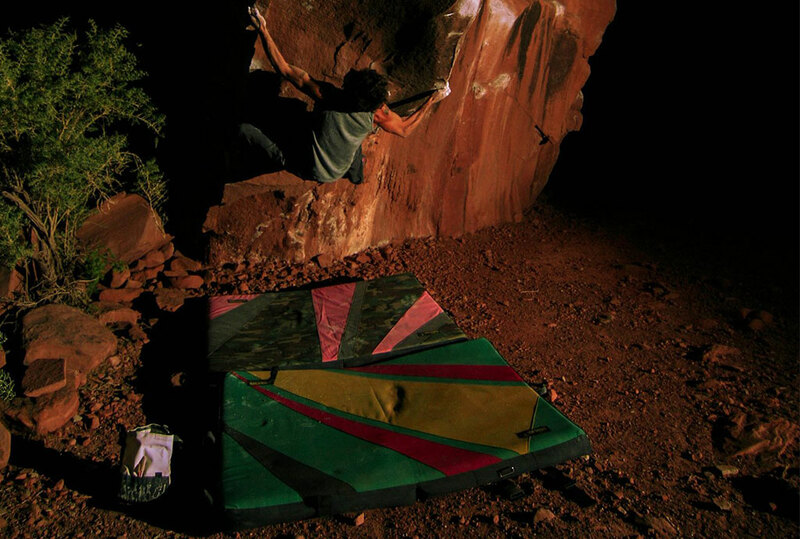 Organic Big Pad is unmatchable when it comes to picking quality and big pad for bouldering. For those who have big campaigns or are big in size, Organic Big Pad is the one to go for. The thick foams are of the highest quality with the ability to absorb the impact of big falls. The landing zone and outer shells are very durable with the ability to last for years. The stitching is of the elite quality and the carrying system is excellent as well. You can also replace the parts if components like shoulder straps, or buckles get damaged. Moreover, the company also offers foam refilling option if you feel the need to refill foam after years of use. With all these quality attributes, Organic Big Pad is the king of big size crashpads.